The Ikon Rose Gold professional scissor is no exception, perfect for all cutting techniques and finished with a glorious rose gold titanium coating. Life span of between 15 and 20 years if maintained and serviced correctly! We are so confident with our products that we offer an exclusive lifetime guarantee plus a 12 month drop warranty. The Matakki Koten is a perfectly engineered professional hair cutting scissor that's made in Japan with a life span of between 20 and 25 years, a great tool for the advanced hair stylist or barber. The leaf is a fabulous light weight all-round hair cutting stylist scissor hand crafted using 440C Hitachi steel from our Japan factory. 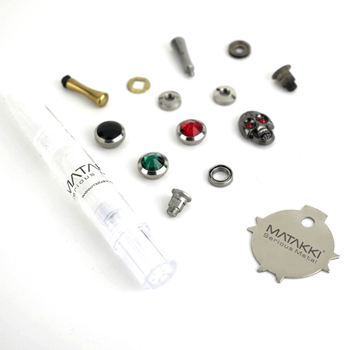 Matakki keep creating high quality tools that some of our competitors charge up to 3 times more for the same scissor! Hand crafted from Japanese Hitachi steel, super sharp convex blades with the addition of a Japanese mythical beast engraved into the handles, what’s not to like. Suitable for all cutting techniques from blunt cutting to point cutting. Hand created using Aichi 440C steel from Japan, the Matakki Dragon hair cutting scissors are stylishly created with a hand cut mythical dragon engraved into the handle making these scissors absolutely one of a kind! Professional light-weight hair-cutting scissor is hand crafted from Japanese steel and designed with a beautiful Japanese flower engraved into the handles. Launched way back in 2003, the Flower hairdressing scissor has been a firm favourite of professional stylists worldwide. The original Gem since we launched this model back in 2003, It’s been imitated by so many other brands but there is only one Matakki Gem. The Gem professional hair cutting scissor is a professional tool designed for all round cutting. Matakki are innovators and leaders in professional scissor designs and at the forefront of technology! The Matakki Gorudo is constructed from premium Japanese Aichi 440C steel with a Rockwell Hardness of 62 creating a super fine and sharp convex cutting edge.